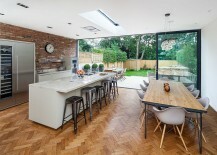 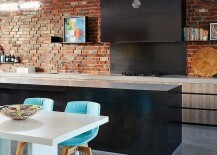 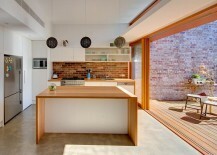 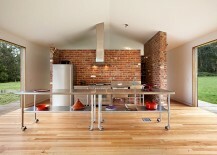 Gone are the days when old brick walls were carefully and meticulously concealed with more polished, modern finishes. 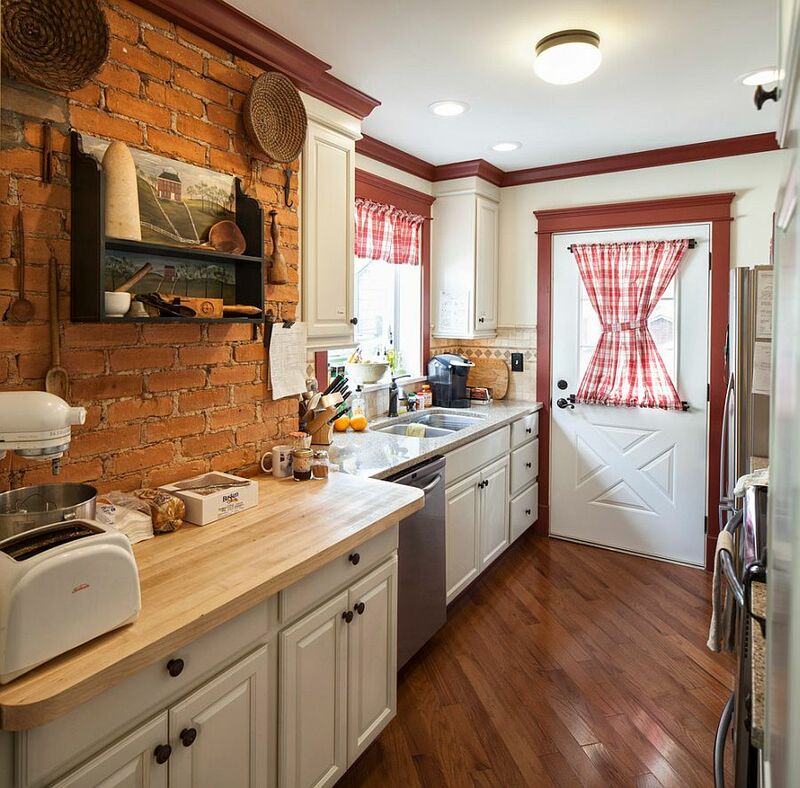 They are no longer viewed as an eyesore, with designers and homeowners keen to showcase the historic past of the home while adding an intriguing textural element. 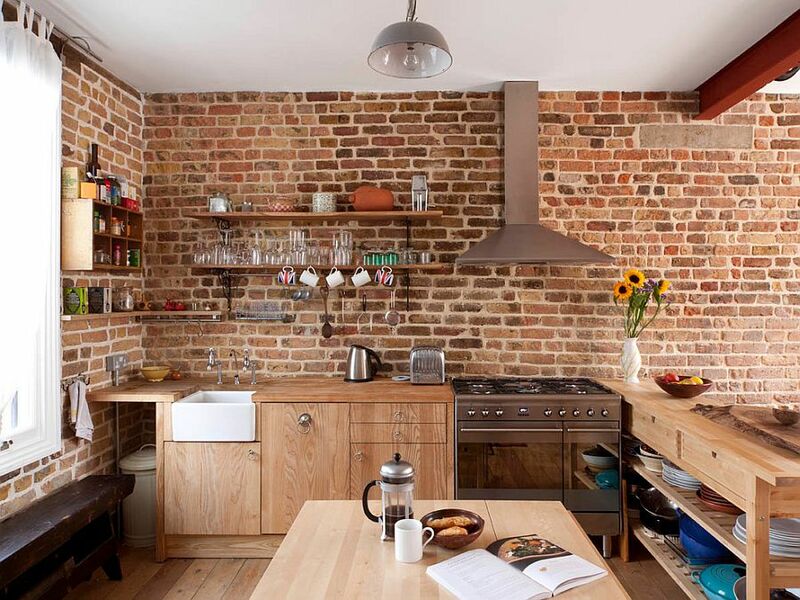 Despite this growing popularity of exposed brick walls, most of us are far more comfortable with using them in bedrooms and living rooms than in modern kitchens. 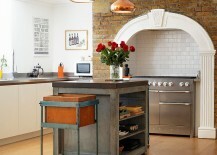 This hesitation comes both from a view that brick walls are crumbly and hard to clean and the fact that they might be aesthetically ‘too heavy’ for the kitchen. 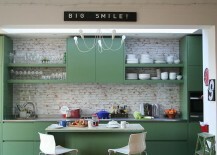 But that is an opinion you might soon reconsider! 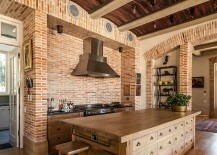 The idea that a brick wall does not fit in with the aura of a contemporary kitchen is a notion that is outdated, as shown by the many innovative kitchen designs that we come across daily. 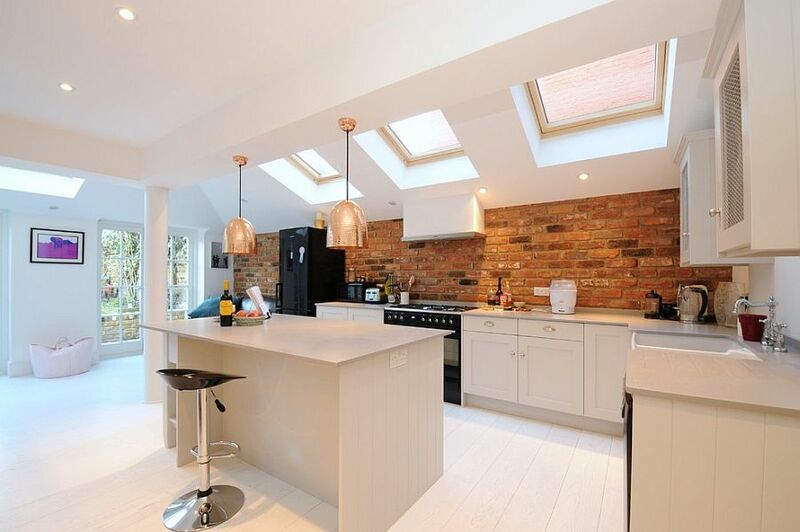 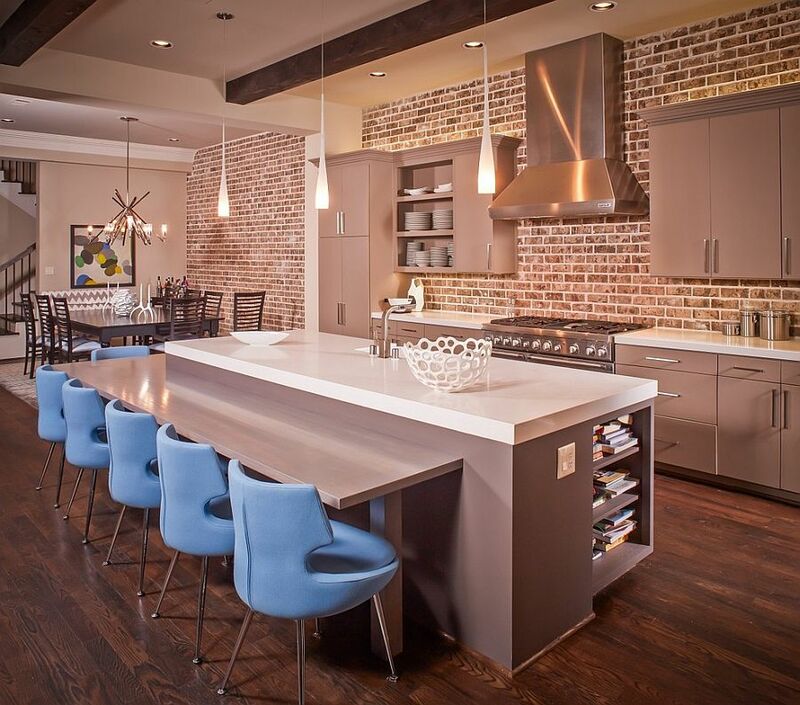 In fact, an exposed brick wall in a modern kitchen does exactly the opposite and ends up becoming the showstopper of the space as it defines spaces and highlights architectural features. 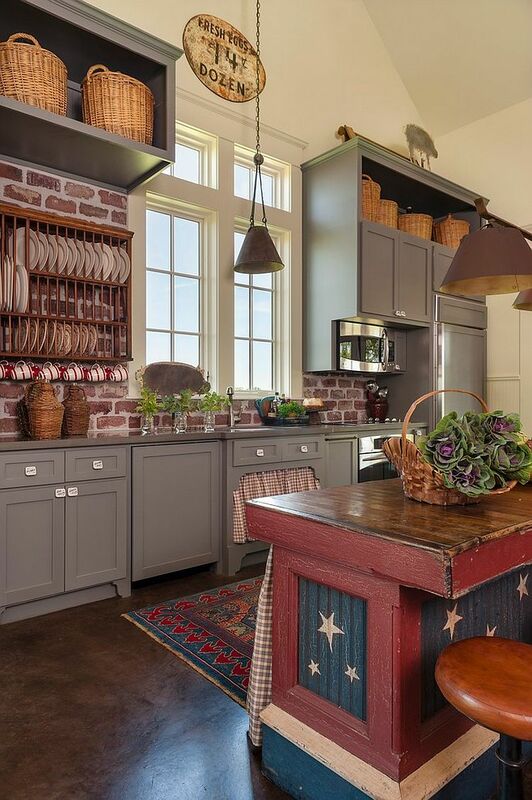 It can be used as a gorgeous accent addition, a beautiful backsplash surrounded by tile, or in a grander and more extensive fashion with a glossy sheen. 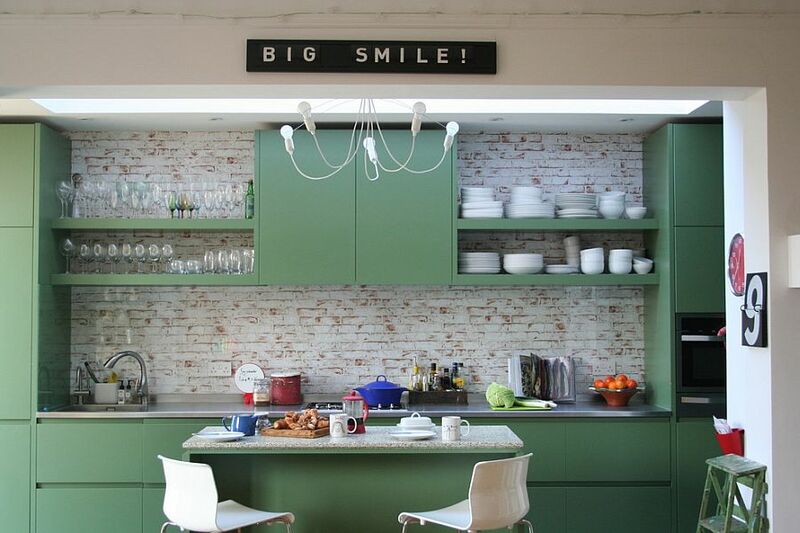 Bold, dashing and inimitable, the brick wall in contemporary kitchen will serve you well for years to come, when done right. 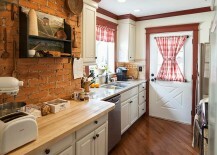 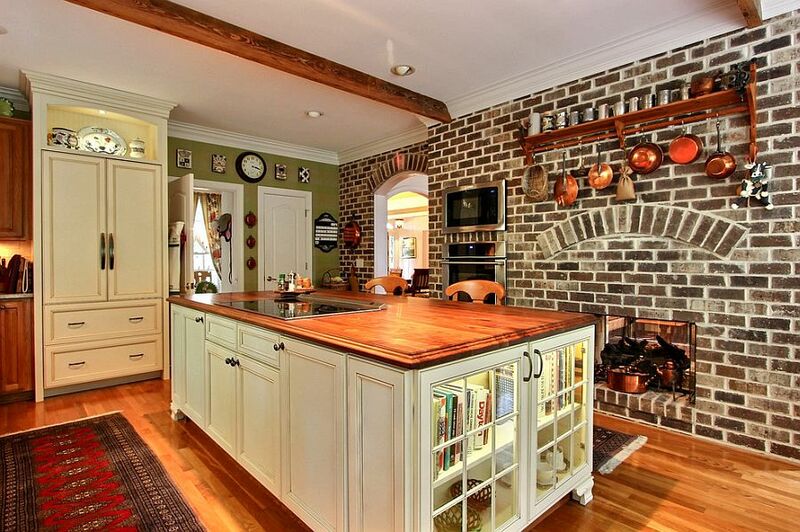 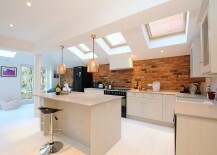 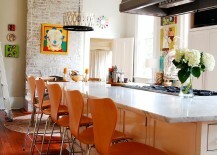 We did allude to the fact that a brick wall in the kitchen is both timeless and trendy. 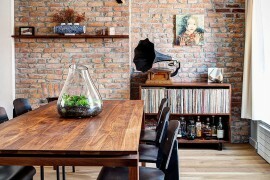 That does sound like a strange statement to make, as something that is timeless often falls out of the trend list with changing eras. 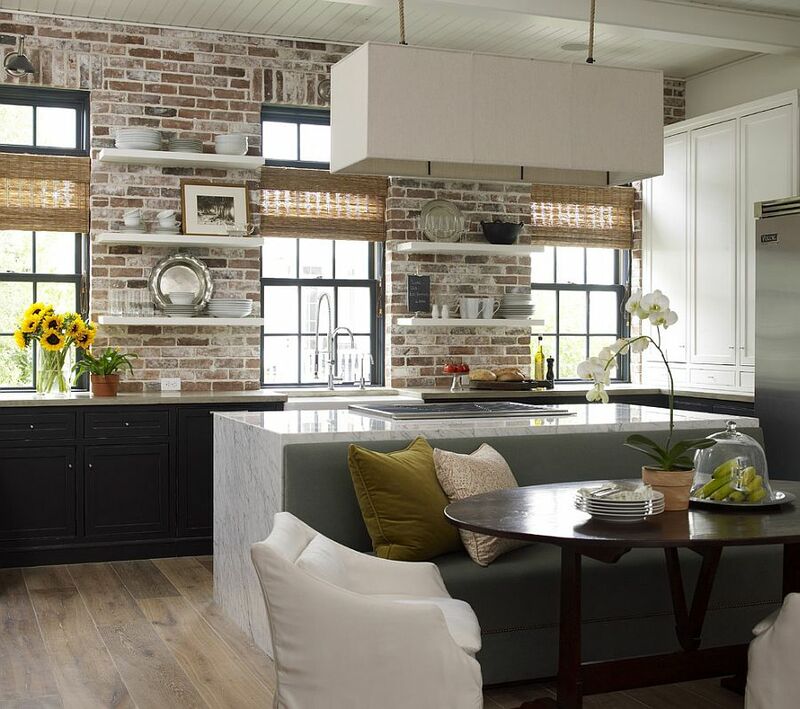 But an exposed brick wall is something that currently falls into both the categories, as it brings a timeless allure even as it consistently tops the design trend charts! 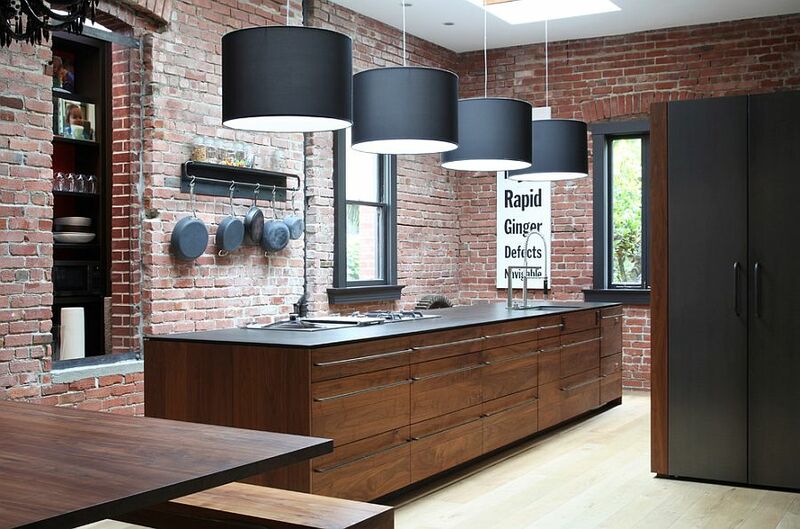 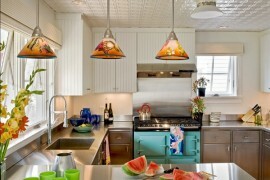 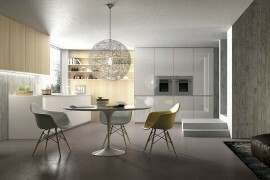 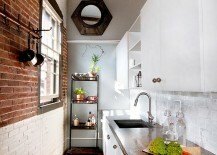 Part of this charisma is down to the renewed popularity of industrial and loft-style kitchens. 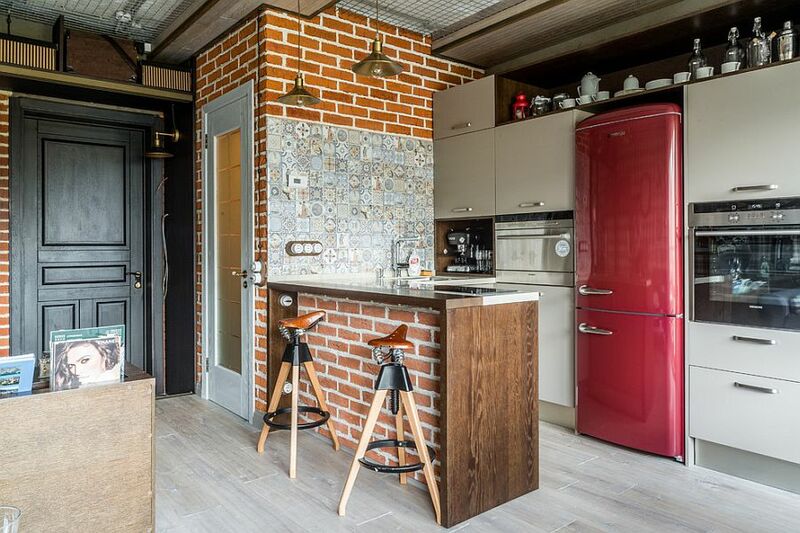 Embracing its practicality, rugged aesthetics and distinct decorating elements, homeowners are once again falling in love with it. 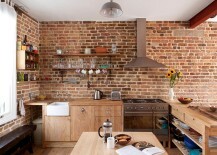 The brick wall fits into this schematic seamlessly! 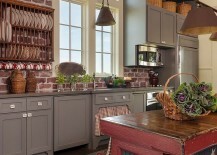 Open shelves, cabinets and custom islands are an inevitable and inherent part of the kitchen design, and a brick wall backdrop must complement the choices you make in this regard as well. 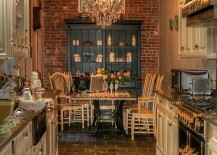 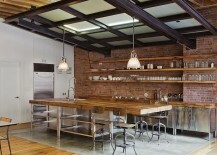 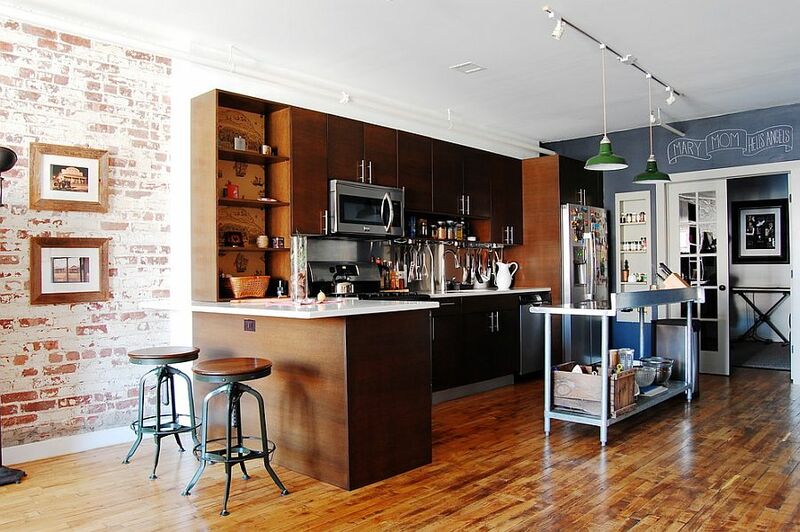 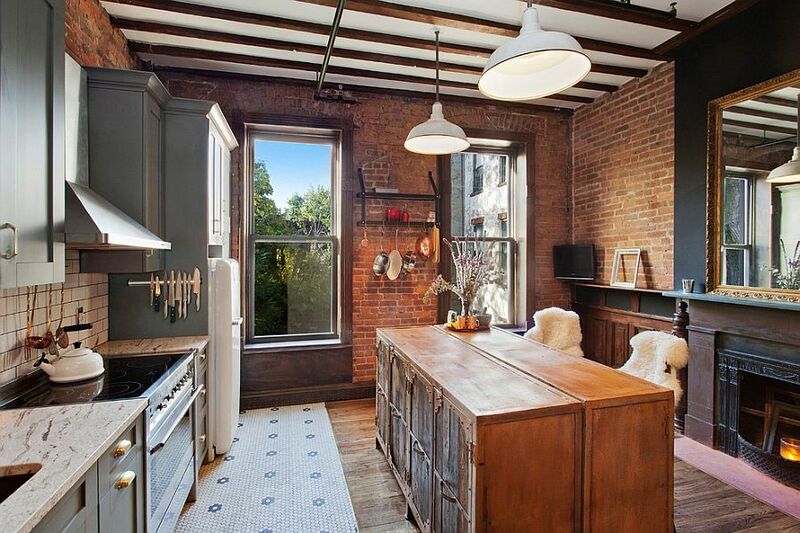 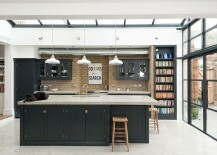 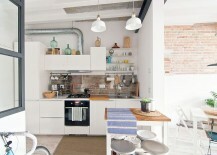 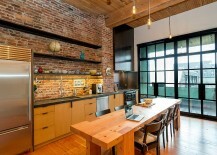 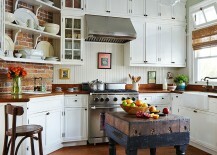 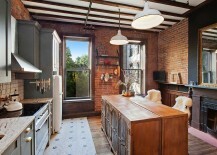 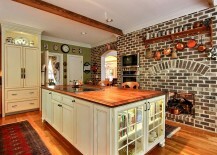 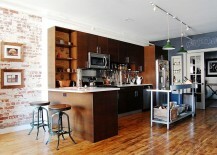 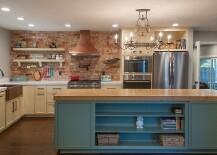 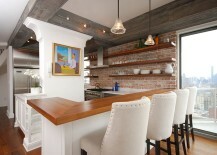 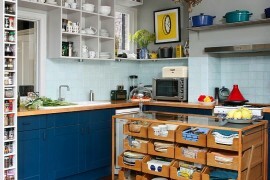 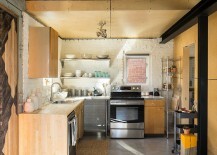 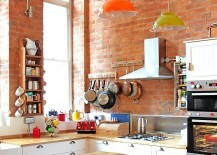 Picking shelving and storage for the kitchen with brick walls often ends up defining its style and ambiance. Open wooden shelves, sturdy cabinets with vintage flair, metallic accents and a central island with a stainless steel countertop point towards a definite industrial style. 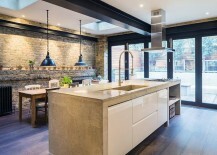 Sleek contemporary surfaces, polished countertops in stone, cabinets with a minimal, glossy appearance and a modern kitchen range turn the kitchen into a contemporary hub. 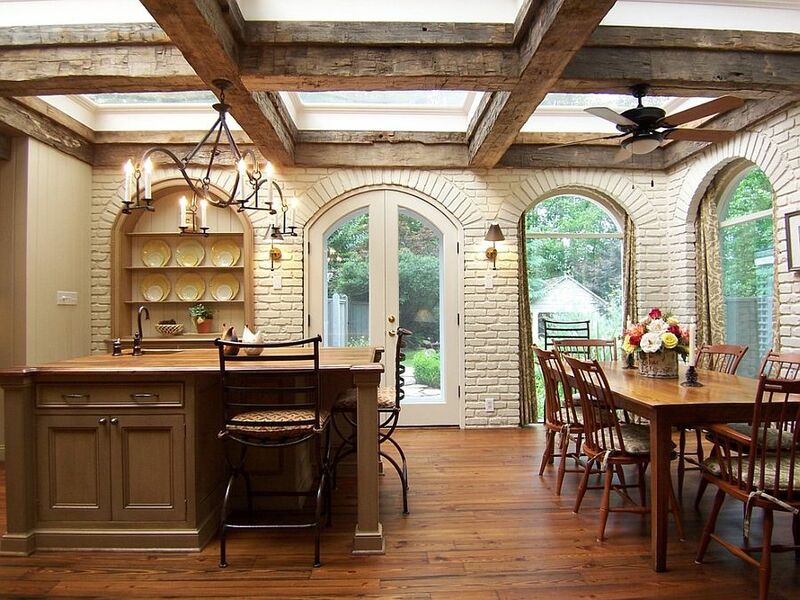 One of the important factors that you need to be mindful of before embracing those old brick walls is their structural integrity. 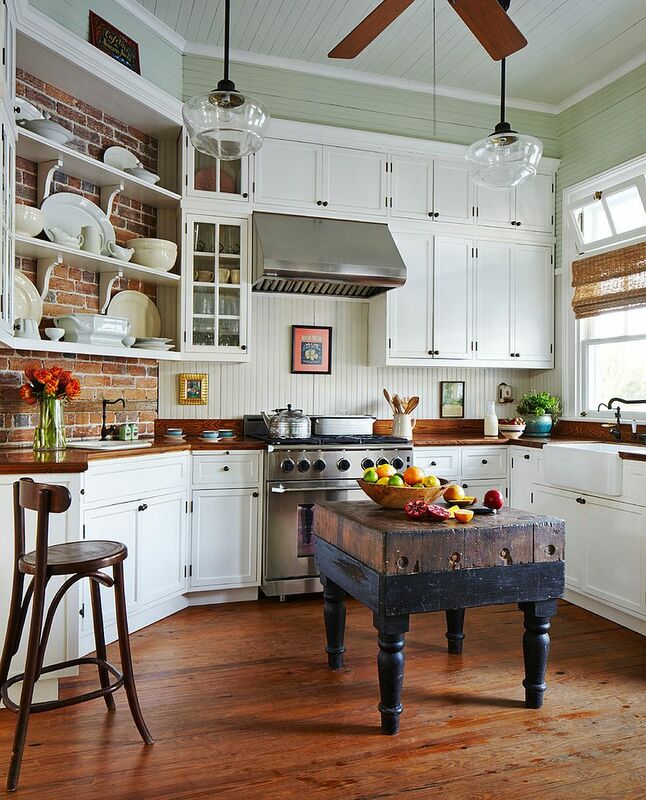 Some of them might not be able to support really heavy cabinets and could need structural reinforcement before you undertake a major kitchen overhaul. 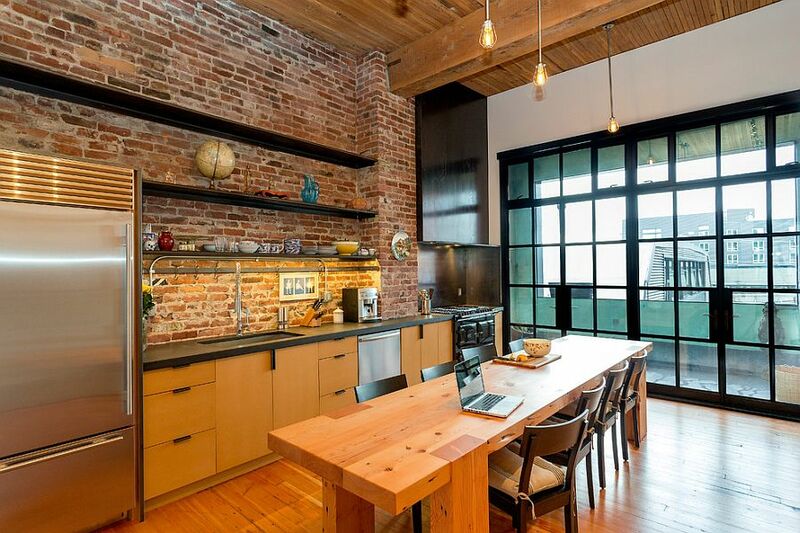 But if it is only aesthetics that you are worried about, then almost any style of cabinets work brilliantly with the exposed brick wall. 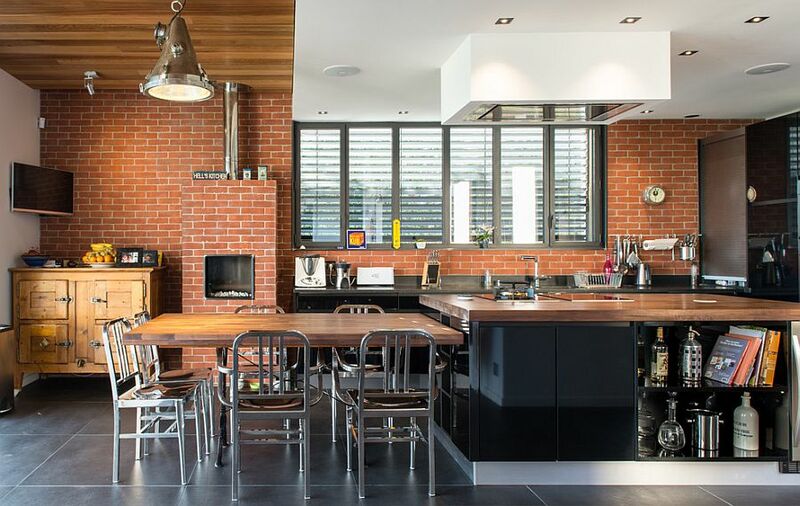 Using a sealant is an obvious must for the brick wall in the kitchen, and depending on the look that you wish to achieve, it could create either a matte or glossy finish. 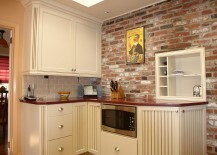 This makes it far easier to clean the brick wall and obviously will preserve its beauty and natural texture. 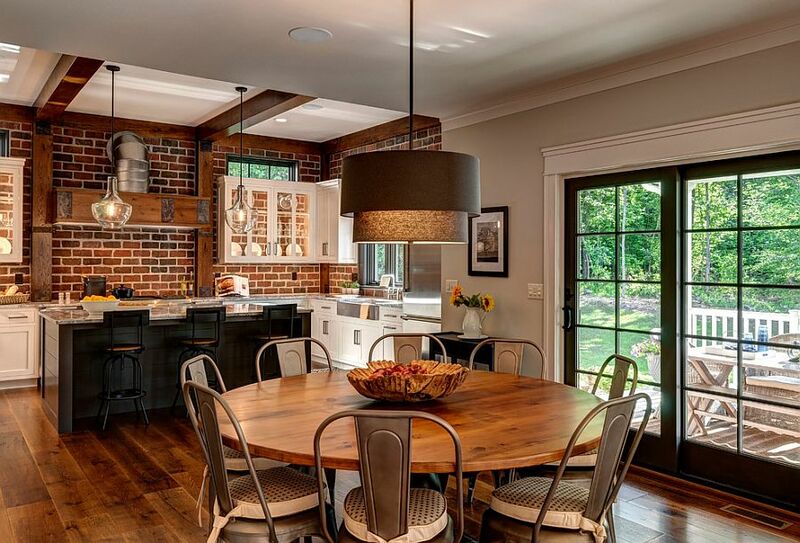 Another favorite among designers is the painted brick wall, as it brings the texture of the brick wall while blending in with the color scheme of the room. 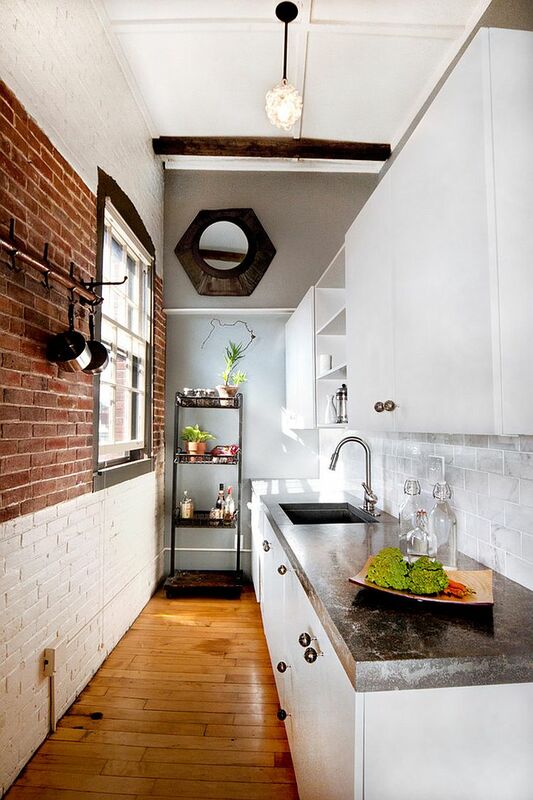 Gray is a popular color in contemporary kitchens, but a whitewashed brick wall or one that is painted white can seem equally enticing. 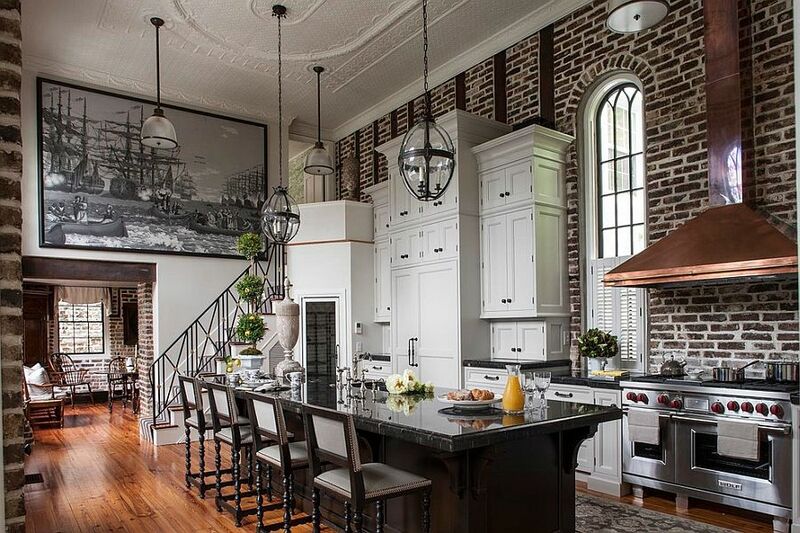 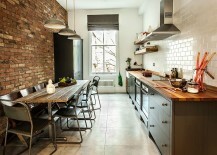 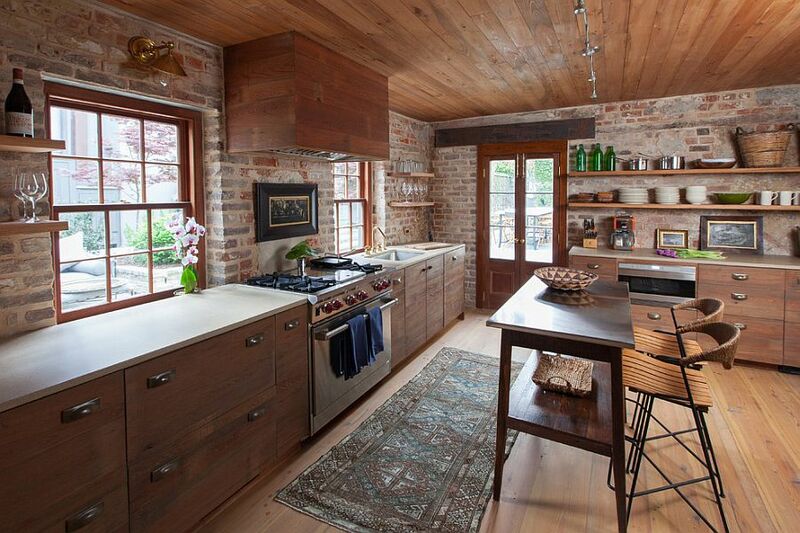 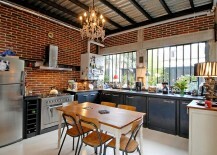 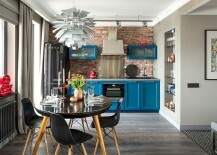 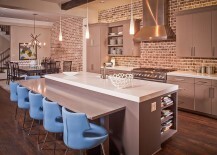 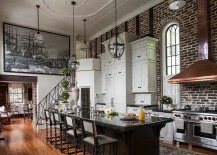 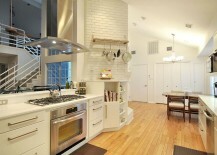 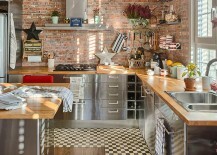 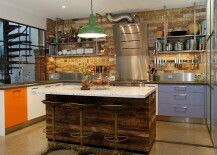 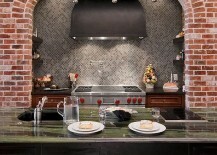 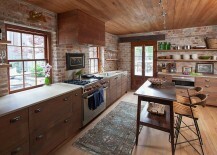 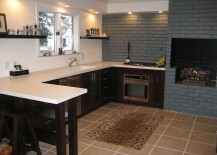 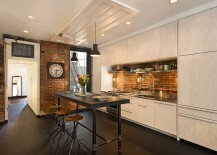 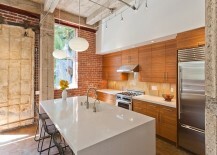 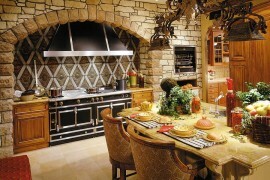 Industrial, contemporary and transitional are the most preferred styles in kitchens with brick walls. 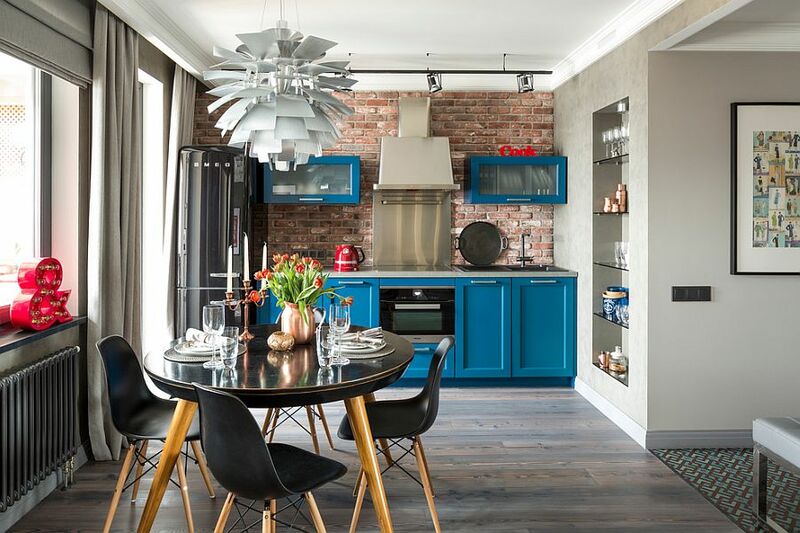 But we at Schulweg are all about going beyond the conventional, and styles such as farmhouse, Mediterranean, rustic, vintage, Victorian and coastal give the kitchen this unexpected and unconventional twist. 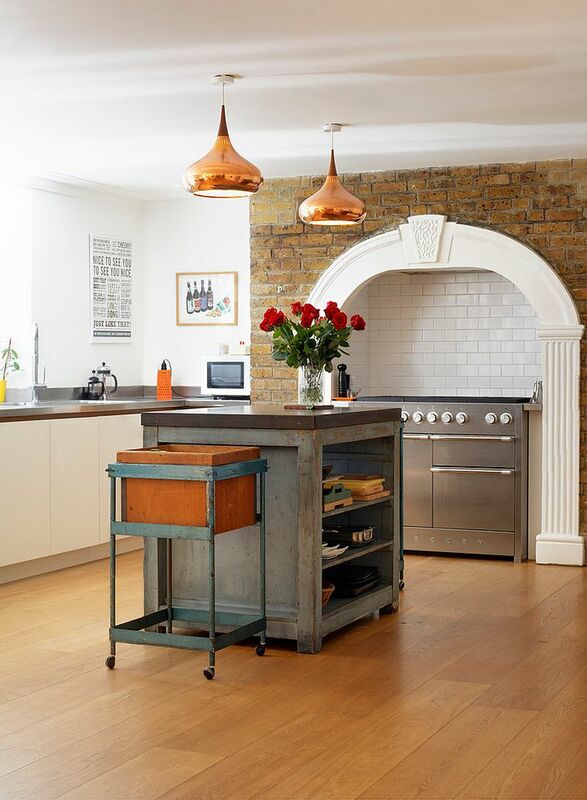 With the kitchen being the heart and soul of every home, a style and theme that moves away from the rest of the house offers a welcome change in setting and turns those fun family evenings into a special occasion. 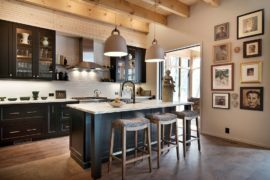 Once again, one can clearly notice a distinct modern influence even in kitchens with traditional and rustic styles as most of us have adapted to the visual of rooms with clean, straight lines and smart ergonomics. 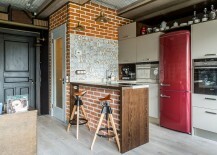 And at times it is this sprinkle of modernity that creates a unique fusion of past and present which is enhanced by the exquisite brick wall in the background.